Ships today if you order in the next 3 hours 47 minutes. 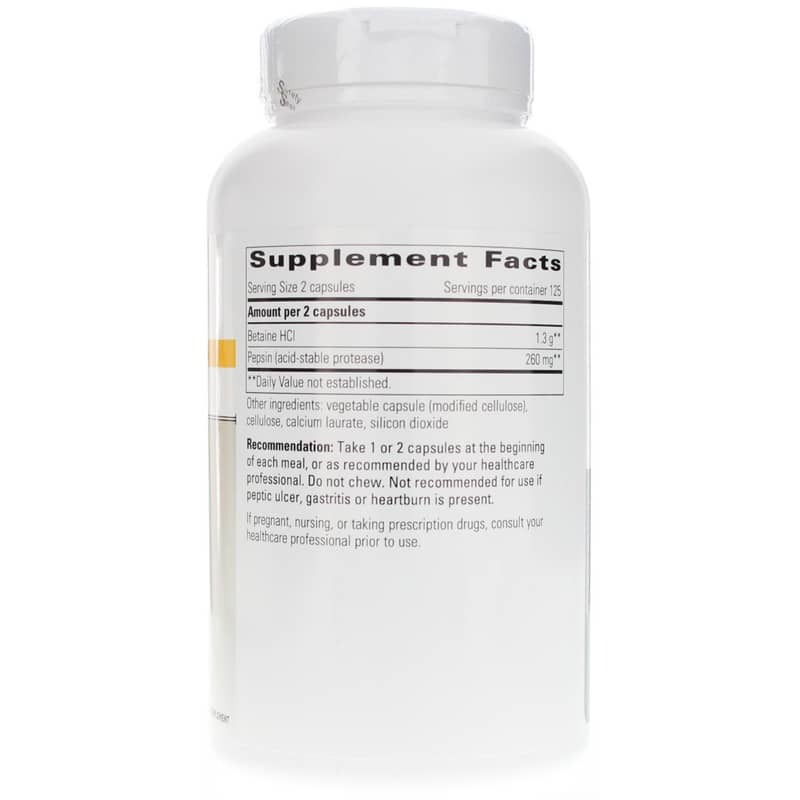 Betaine HCl with Pepsin is designed to give you natural digestive support. It could promote healthy stomach acidity, gastric function and the digestion of protein. 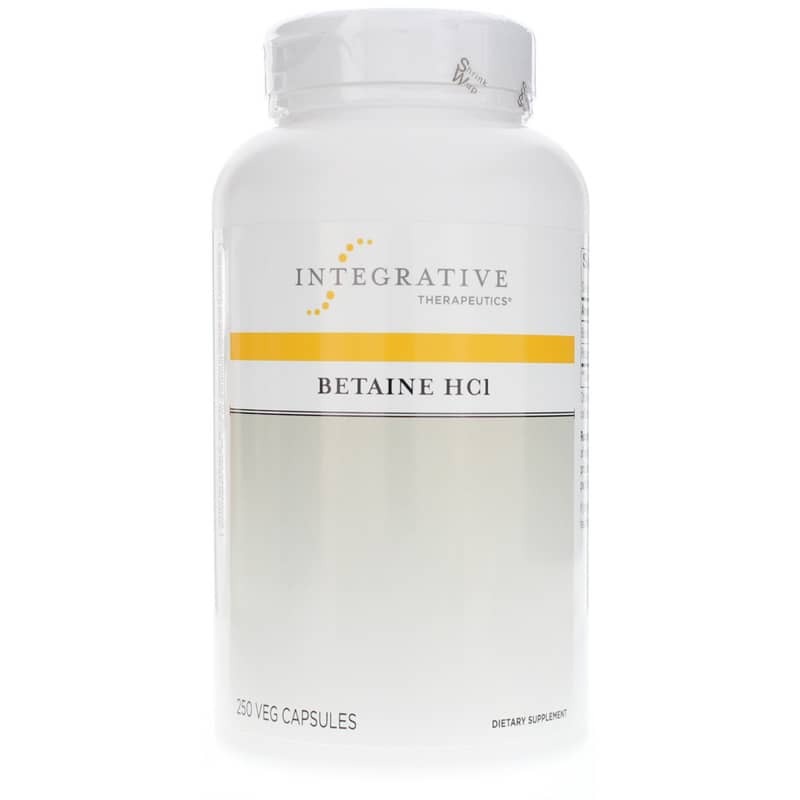 Most importantly, Betaine is connected to healthy homocysteine levels. Elevated homocysteine levels, which increase as you age, appear to be linked to heart issues, blood clots and bone fractures. Betaine also mirrors the action of proper stomach acid levels - which may make digestion more comfortable. Hydrochloric acid (HCl) helps your body absorb vitamins - increasing their bioavailability. Pepsin is a powerful enzyme that can assist in the process of breaking down proteins into amino acids. Your body can then use those amino acids as a source of energy. Research shows good HCl levels support natural pepsin production. This nutritional supplement may be able to improve your digestion. That means your body could get more of the nutrients it needs while making everything a bit easier on your stomach. Other Ingredients: vegetable capsule (modified cellulose), cellulose, calcium laurate, and silicon dioxide. Contains NO: sugar, salt, yeast, wheat, gluten, corn, soy, dairy products, artificial coloring, artificial flavoring or preservatives. This product contains natural ingredients; color variations are normal. Adults: Take 1 or 2 capsules at the beginning of each meal, or as directed by your healthcare practitioner. DO NOT chew. Not recommended for use if peptic ulcer, gastritis or heartburn is present. Do not chew. Not recommended for use if peptic ulcer, gastritis or heartburn is present. If you are pregnant, nursing, or taking prescription drugs, consult your healthcare practitioner prior to use. I was having stomach pain and bloating after every meal. I do not secrete enough stomach acid and my body wasn't able to digest food well My naturopath started me on this supplement and the pain and bloating stopped with the first dose (2). The price through Natural Healthy Concepts is much more reasonable than purchasing through the Doctor. I receive my order quickly each time I order. I recently purchased some Betaine HCL with Pepsin from Natural Healthy Concepts. The price was great and the quality of the product is very good. I am very satisfied with shopping at Natural Healthy Concepts. I have returned to their website many times and will do so in the future.